Sacroiliac surgery can be used to treat various types of SI joint issues. Surgery is usually considered to be optional for virtually all sacroiliac joint diagnoses, with very few cases presenting actual surgical emergencies. In fact, the indications for SI surgery are rather ambiguous when compared to indications for nonsurgical treatment. Sacroiliac joint surgery can seek to address ligament laxity or tension using minimally invasive techniques that improve soft tissue tone, or might seek to fuse the joint in an effort to relieve an assortment of problematic conditions. SI fixation using surgical hardware is certainly the most commonly utilized invasive approach to care. This resource section provides an overview of sacroiliac joint surgery techniques including their indications, benefits and risks. If you are researching the efficacy of SI surgery practices, this is the right section for you. Sacroiliac joint surgery should always be held in reserve for patients with the very worst varieties of pain. Few patients present surgical emergencies, so the vast majority of SIJ surgery is considered elective. Few quality surgeons will even consider performing surgery unless the patients has been suffering for at least 6 months, but the best surgeons will reserve surgical intervention for even more highly-defined case parameters. When indicated and successful, SI surgery, regardless of the variety performed, can mitigate symptoms considerably or even result in complete cures for all discomfort once full healing has taken place. Most surgical techniques are well tolerated in healthy patients and do not leave the same degree of inherent collateral trauma that is created by spinal surgery in most instances. For patients who have not responded to conservative care, surgery offers the chance to overcome their suffering. However, it must be noted that in many instances, when conservative care fails, it is the diagnosis that is incorrect, rather than a sign of therapeutic incompetence. In these cases, surgery stands little hope of being any more effective, so patients are warned to double or triple check the accuracy of any diagnostic verdict prior to considering surgical intervention. Misdiagnosis is surely the most common explanation for surgical failure. Sacroiliac fusion surgery can be accomplished using numerous approaches to care. Joint fusion is the most often used form of SIJ procedure, regardless of diagnosis. Sacroiliac joint fixation surgery can be achieved using specific protocols, such as the SI-LOK system or general bone fixation techniques. Sacroiliac ligament surgery can correct laxity (most often) or hypomobility (rarely), using less invasive operative interventions. Failed sacroiliac surgery is usually the result of misdiagnosis leading to treatment that does not target the true source or mechanism of pain. Sacroiliac procedures can address skeletal structures, ligaments or muscular tissues, depending on the particulars of the pain syndrome being treated. 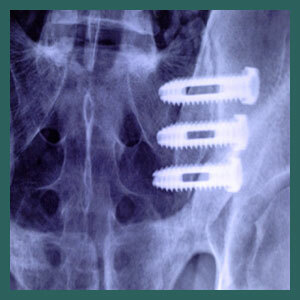 Sacroiliac surgical consultations can be intimidating. Be sure to be well armed with knowledge before meeting with a surgeon or face the very real possibility of enduring unnecessary or premature surgical intervention that might not even be effective. Sacroiliac surgeons are usually orthopedic specialists who focus much of their practice on resolving chronic joint pain problems. Sacroiliac nerve ablation can eliminate pain temporarily or even permanently from the SI joint, despite the underlying mechanism for pain continuing. Sacroiliac pain and spondylodesis are proven to be related factors in many patients. Spinal fusion often leads to related SIJ symptomology. Sacroiliac laser surgery can improve outcomes and minimize some risks for improved results. Minimally invasive sacroiliac surgery is the rule when it comes to most operative interventions, although some are still performed using traditional open surgical approaches. Surgical endeavors are always risky and demonstrate inherent downsides when compared to conservative care. Patients who are desperate enough to try surgery always think that things can not get any worse, but they are wrong, as some discover postoperatively. Surgery can do permanent anatomical damage that can not be repaired in some instances, potentially increasing pain and functional disability, rather than relieving it. Some of the most common risks of SI joint surgery include infection, blood loss, collateral damage to healthy tissues (nerves, circulatory vessels, soft tissues) and poor results. Some fusions do not fuse, escalating symptomology and requiring additional surgical procedures to resolve. However, all this being said, SI joint surgery is usually far less complex than spinal surgery and generally enjoys better postoperative results for most patients and most diagnoses. While surgery is never something to consider casually, it might be the perfect solution for patients who are fortunate enough to have accurate diagnoses and positive prognoses for operative care. Our Cure Back Pain Forever Program has helped many patients to avoid sacroiliac surgery. Better still, it has ended their suffering for good. You can get help 24 hours a day from anywhere in the world.